PR pros look back on nearly a decade of pitching the iconic show. The Colbert Report aired its final episode Thursday night, wrapping up a cultural institution and retiring Stephen Colbert – the character, that is – after nine years on the air. Time called Colbert’s Colbert "one of the greatest sustained performances in pop culture, TV, or otherwise," and while many will recall him for his faux conservative blowhard character, some PR professionals have their own memories of pitching the show’s writers and editors. Several industry veterans shared their stories with PRWeek. Pilot Pen took interest in Stephen putting Bill O'Reilly's microwave up for auction to benefit the Yellow Ribbon Fund. 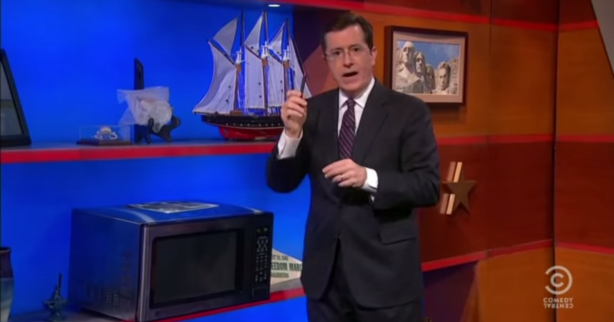 As the online auction for O'Reilly's microwave continued, both Colbert and O'Reilly continued to discuss it. In the original segment, Stephen also mentioned he was going to sell his Pilot pen, although it was never actually put up for bid. Pilot created a rebuttal video and offered to buy Stephen's Pilot pen for $5,000 that can be donated to the Yellow Ribbon Fund charity. The Bright Red PR team contacted many people at The Colbert Report and forwarded the pitch to co-executive producer Meredith Bennett. Bennett was great to work with. She was very engaged and was instrumental to making sure Pilot was mentioned on air. We loved working with them and Pilot ended up gifting one of Pilot’s fine writing Namiki fountain pens as a gift for a producer on the show. This was a few years ago, but at the time, I was working at the agency Peppercomm and pitching on behalf of a large consumer brand I was working on. I'm an avid Colbert watcher and he had just done a segment that mentioned The Olive Garden and made some jokes about how unlimited breadsticks weren’t really unlimited if they wouldn’t allow him to pull up a pickup truck and just take as many as he wanted and load them into the truck. The brand was the restaurant TGI Fridays. I thought it would be brilliant to pitch the idea of having Stephen come and test their old tagline: "In here, it's always Friday." But, was it always Friday? Could you forget what day it was? That's why we needed a truth-seeker like Stephen to see if Fridays had got it right or needed to reevaluate their tag. I sent an email to a few producers outlining the idea and mentioned that we should have him spend a non-Friday in the restaurant to really test things out. Since I truly thought this would be perfect for them – minus the fact that he is usually in-studio – I followed up by phone. Luckily, I got someone on the line. The producer I spoke with laughed hard and then just said, "That’s funny, but no." I was very happy that I did receive an answer and, in lieu of them moving forward with my idea, I am glad I made the producer laugh. I was working for a boutique PR firm based in Glen Rock, New Jersey, Caugherty Hahn Communications, in 2006, and Highlights for Children hired us to promote its 60th anniversary and printing of its one billionth copy. After a big national push in early June of that year, Highlights for Children was featured by the Associated Press, nearly every newspaper in the country, an exclusive story on the CBS Evening News, and coverage by all of the network and leading cable TV news stations. Naturally, we wanted more. So we thought of the late-night talk shows, figuring that the average viewer would be in the age range of either having been a former subscriber or a parent of one. We sent media kits with copies of the magazine to all of the top shows, including The Colbert Report, which was at the time less than a year old itself. (I was a big fan of the show). Upon follow-up, we learned from the producer that Stephen (the person, not the character) was a former subscriber of the magazine and was interested in featuring it on the show. We weren't sure if he wanted to have the publisher or editor in-studio for an interview or if he was going to mention it as part of his "news" segment. But in the end, he decided to close his show with a stand-up (albeit tongue-in-cheek) about the magazine during his show sign-off, referencing the timeless characters, Goofus and Gallant, Hidden Pictures, and other aspects of the magazine (including its prominence at doctor and dentist offices). He then proceeded to place the copy of the magazine on his "bookshelf," which was one of the highlights – pun intended – of our campaign. I had fun working with producers at The Colbert Report. I pitched and placed a segment in 2010 with Dean Kamen, inventor and founder of FIRST, a not-for-profit that inspires young people to become science and technology leaders. Kamen discussed the Luke Arm, his robotic invention to help war veterans who lost their limbs, and gave Colbert a high five wearing the robotic arm. The segment gained traction online as sites such as Huffington Post, Pop Sci, and others posted the clip with commentary. As part of the segment, Kamen was also able to talk about FIRST and his vision to honor kids’ accomplishments and make being smart cool. Today, it’s rewarding to see that science and technology has become much more mainstream and more celebrated in our culture. I’ve always loved working with Stephen and his team. I remember when I worked at the US Department of Education and Secretary Margaret Spellings became the first sitting cabinet member to go on The Daily Show with Jon Stewart. Colbert’s show had just started, and they called me to put Margaret on his show as well. The show was way too new, and he was way too unpredictable for a politician to go on in 2009. I still think politicians are hesitant to go on and have that "gotcha" moment.